I am excited to be judging some cocktails tonight. 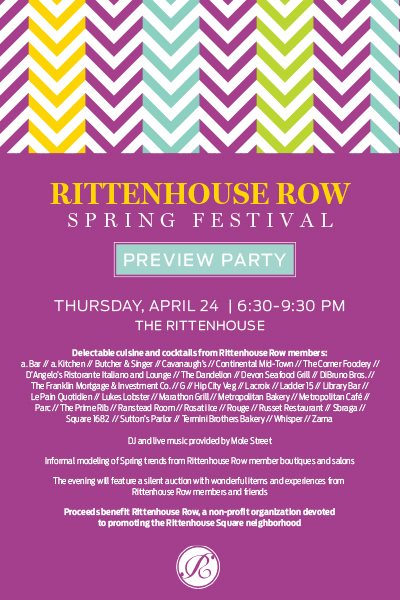 The 2014 Rittenhouse Row Spring Festival Preview Party will be held on Thursday, April 24th from 6:30-9:30PM in the Ballroom and Grand Salon at The Rittenhouse Hotel, 210 West Rittenhouse Square. The evening will feature cuisine and cocktails from Rittenhouse Row’s best bars and restaurants, as well as a silent auction with Rittenhouse Row experiences and merchandise. Participating bars and restaurant include (list incomplete): a. Bar, a. Kitchen, Butcher & Singer, Continental Mid-Town, Cavanaugh’s Rittenhouse, The Corner Foodery, D’Angelo’s Ristorante Italiano and Lounge, Devon Seafood Grill, The Dandelion, DiBruno Bros., The Franklin Mortgage & Investment Co., G, Hip City Veg, Lacroix, Ladder 15, Library Bar, Le Pain Quotidien, Luke’s Lobster, Marathon Grill, The Prime Rib, Ranstead Room, Rouge, Rosati Ice, Russet Restaurant, Sbraga, Square 1682, Sutton’s Parlor, Termini Brothers Bakery, Whisper, Zama and more. Participating bars will be competing to see who makes the judges favorite cocktail. DJ and live music will be provided by Mole Street. Tickets are $75 per person for general admission and $125 per person at the Patron level and can be purchased in advance by visiting, http://rittrow.ticketleap.com/2014previewparty/. Those who purchase Patron level tickets will be given access to the VIP Area at the Rittenhouse Row Spring Festival. To honor its 25th anniversary this year and showcase the newly renovated hotel features, The Rittenhouse will provide a glimpse into several of the best ways to experience its luxurious offerings, including a sneak preview of The Rittenhouse Spa & Club – Hair by Paul Labrecque, delicious and innovative treats from Executive Chef Jon Cichon and Pastry Chef Tova Du Plessis of Lacroix as well as handcrafted cocktails from Papi Hurtado of the hotel’s Library Bar. Keep the night going after the event by enjoying a few more of Papi’s specialty drinks at the hotel’s exclusive Library Bar.